When she was a little girl Adelaide Wilson (Lupita Nyong’o) wandered off from a family outing at the carnival to find herself in a mirror maze funhouse. The childhood trauma has forever changed her life. Now as an adult with kids of her own, her husband Gabe (Winston Duke) wants to take a vacation to the beach, the same beach where Adelaide got lost as a child. Her past literally comes back to haunt her as the shadows of the living step out of the darkness to take their rightful place in the light. Lifelong comedian Jordan Peele’s highly anticipated second feature follows up the acclaimed director’s debut horror film Get Out with the simply titled, Us. A family of four on vacation is met with their grotesque doppelgangers standing at their door and trying to kill them. Innovative with a nice mix of comedy and horror, Get Out was one of my favorite movies of 2017. Us has too much comedy that’s out of place and doesn’t fit in a horror film taking any potential scares out of the feature. Perfect production values are outdone by the performances of Lupita Nyong’o, Shahadi Wright Joseph and Evan Alex. The small cast of mainly four actors play dual roles of good and evil. 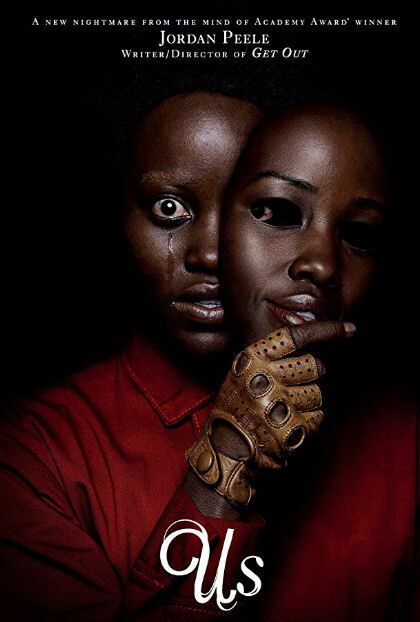 Lupita Nyong’o stands out in what will probably be the best horror performance of the year. Her counterpart husband played by Winston Duke is a completely out of place comedic character that just doesn’t fit into the rest of the movie. Before the horror sets in, a standard comedic father role is fine. When the family is threatened, Duke’s performance is just simple awkward. Equally unfit in their comedic roles are the neighboring Tyler family played by Elisabeth Moss, Tim Heidecker and Noelle and Cali Sheldon. As everyone quickly dies around them without hesitation, the Wilson family survives as their multiple attempted killers want to play with their prey instead of murder them like everyone else for some reason. Uniformed killers with matching Michael Jackson single gloves choose a pair of scissors as their murder weapons. Several disjointed fragments barely make sense when pulled together in a surprise ending. A lot of frustration with storytelling is covered up by excellent production values and performances.